Ahoy there, me hearties! This is the swashbuckling tale of skullduggery upon the high seas, treasure on a desert island, a Guatemalan crimson parakeet going by the name of Cap’n Haddock, Dame Ladd’s fisherman’s pies, and death by chocolate! Avast behind, shipmates! Stand by to go about for the pantomime version of the swashbuckling classic. All the very best of traditional pantomime, including custard pies, exploding cannon, gaudy costumes, and no opportunity missed to press-gang the audience into the thick of the seafaring action! Jim Ladd (the youthful hero of our seafaring yarn) stumbles across a mysterious map, showing the whereabouts of the buried treasure of infamous pirate captain, Squint. In the company of Mrs. Ladd (Jim’s mother and indomitable pantomime dame), Squire Polperro, Doctor Liversausage, and Captain Smellit, Jim sets out to recover the treasure. Yet he is blissfully unaware that the vessel they embark on is run by none other than Squint’s old gang, led by the rascally, one-legged Long John Slither, and his disreputable henchmen Israel Feet and Blind Pewk! 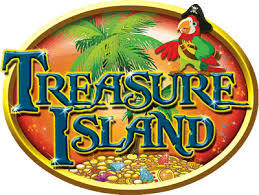 A roller coaster ride of adventure ensues, both aboard ship and on Treasure Island itself, during which we encounter a variety of other madcap panto characters. Cutlass duels, gruesome punishments, and heavy name-calling, all form essential ingredients of a buccaneering plot sure to delight youngsters and adults alike. An absolute must for anyone addicted to either pirates or pantomimes!